Madness: The quality or condition of being insane. See Synonyms at insanity. Great folly: It was sheer madness to attempt the drive during a blizzard. Fury; rage. Enthusiasm; excitement. Mum where’s this, mum where’s that? Where’s my coat and where’s my hat? Where are my shoes and where is my book? Where’s my school bag I can’t find it? LOOK! I can’t find my pencils, mum where are my pens? I’m going to be late now, late for my friends! I can’t find my glasses now where are they? THINK! I left it there I know I did, mum is it near? I need my PE kit, mum where is my purse? Why can’t I find them, have you moved them? SEARCH! When you pick me up can you my dance stuff bring? Think it’s in my room, I’m not sure. SEE! The door slams shut, the children are gone. The husband appears, says where are my keys? Where’s my laptop bag can you find them, PLEASE? Then you’ll search and panic no more. Hello! My name is Fred and I am four years old, which is very big. A couple of weeks ago my mummy went to London. I didn’t like the sound of this at first as I quite like my mummy being here, but she told me it was for very important things so I let her go. And I was pleased she did because when she came back she brought some amazing books with her for me to read! The first book she brought back was about dinosaurs which are my most favouritest things ever! 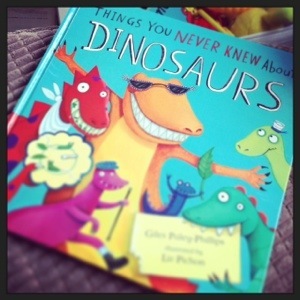 It is called ‘Things you never knew about dinosaurs’ by Giles Paley-Phillips and I only had to look at the front cover to know I’d like the books as the pictures of the dinosaurs were all very funny and made me laugh! There was one with slime in his mouth! I asked mummy which one made her laugh and she said the one with the sunglasses on because he had a funny smile. 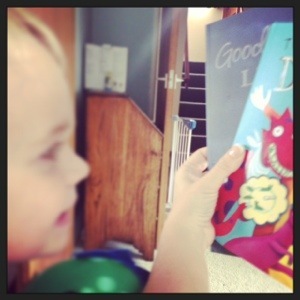 It’s a rhyming book and tells me about all of the things dinosaurs do, did you know they like trampolining? And it says they don’t like Maths which is silly because Maths is brilliant! I was a bit scared on the last page though when I saw a dinosaur with a big knife and fork….I really hope he doesn’t want to eat me, I don’t think I taste very nice! 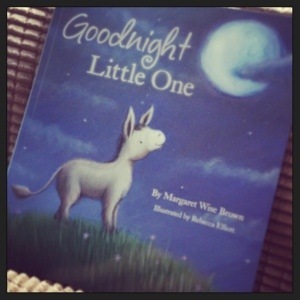 The other book mummy brought home from London was a book called ‘Goodnight Little One’ by Margaret Wise Brown. I like this one at bedtime as it makes me all nice and sleepy. It’s got lots of my favourite animals in it like monkeys, I love monkeys, they are super cool. 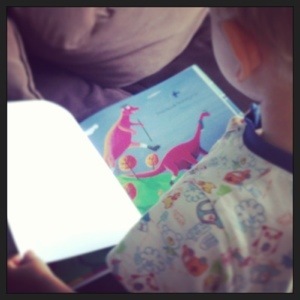 The book shows lots of animals going to bed and when mummy reads it the rhythm of the words makes me feel sleepy too. *yawns* I’m tired just thinking about it! I like both of these books very much and have decided that mummy can now go to London whenever she wants, as long as she brings me back some books!